Networking is valuable for getting a lead on a job, gathering information, or connecting with people in your dream company. Most of us are not born networkers. Practice and preparation will help you develop the skills it takes to be effective when navigating any networking event. Set a goal for yourself. Think about what you’d like from the event. Who will be attending? Review the RSVP list before the event. We share lists of attendees in advance of large events like career fairs. Practice your “30-second” introduction. Prepare an introduction that briefly highlights your experiences and interests. It also helps to develop questions and to keep in touch with news of the day for easy conversation. Bring business cards and a pen, and have them accessible. 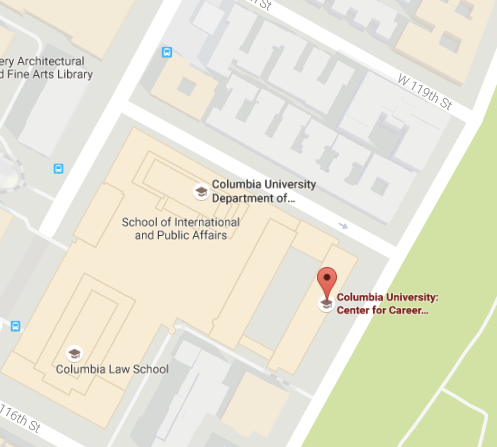 Consider ordering Student Business Cards through Columbia University Print Services. For some on-campus events, bring your resumes. Dress appropriately. Check with the event organizer or online for the dress code. Note: you can borrow a suit from our Clothing Closet. Once you arrive on-site, it’s time to work the event. Check out the registration table. Review the list of registrants or look at the name badges. Sometimes, students, alumni, and employers have different name tags to make it easy to find people. You can check in to see if your targeted people have arrived. Travel light and check your coat. Keep one hand free so you can shake hands with new contacts. Walk with confidence and smile. Carry yourself with openness and comfort. Don’t fold your arms. As you walk around the room, acknowledge the people you see. You are all navigating the crowd and appreciate a ”hello”. Be the first to extend your hand. Show your eagerness to speak and interact with the other person. You can smile, keep your arms comfortably at your side, and make eye contact. Express interest and be attentive. Try to associate the person’s name with something to help you remember the name. Ask open-ended questions, be genuine and curious to get to know the person’s interests and experiences. Hand out your card (or resume) after making a connection. When you receive a business card, pause to look at it as there may be something that generates further discussion. After your conversation, jot a note on the back to remind you of it. Approach people who are alone and interact with new people. Take the initiative to go up to individuals or groups and connect with them. Don’t spend too much time with any one person. Suggest a specific follow-up activity such as lunch, coffee or a phone call, and then move on. Remember to say goodbye to each person in a group before leaving it. Keep realistic expectations. You’re not there to get a job on the spot; you are there to make new connections and follow up with a phone call or meeting. One useful contact can make the whole event worthwhile! It’s always a great idea to follow up with individuals you met at a networking event. Send an email or LinkedIn message to say you enjoyed meeting them. Make reference to a topic you discussed or an interest you share. Record the contact information or connect on LinkedIn. You might even create a special category that enables you to sort your list by the event or discussion. If they live within the area and you had an engaging conversation, suggest scheduling a follow up. For others, put a reminder on your calendar to send a note to stay in touch (e.g., holiday messages, upcoming events, and personal updates). Do a search on Google and LinkedIn to look at their individual bios and profiles. Consider setting up a Google News Alert on those who work for companies you want to follow. Follow on Twitter if appropriate.